Shahidul Islam Khokon, Hope for an Embryo 16, new media, 2013. The white, blood-soaked towel is a sickening sight. It hangs on the wall next to a toilet. Have a closer look, and you will see four words written inside the bowl: Secularism, Socialism, Nationalism and Democracy. These are the columns of the constitution of Bangladesh. From time to time, the spectator can hear the flush-sound of a toilet. It seems as if the art installation could speak– that although we were told differently, those four words have just been flushed down the toilet after the liberation war. Monjur Ahmed's artwork called “After 72” is part of an ongoing exhibition of seven artists from the Santaran Art Organisation in the Bengal Art Lounge in Gulshan that can be seen until 12 February. It is a typical work for the group of young artists from Chittagong. The exhibition titled “Equation of Time and Art” in Bengal Art Lounge is full of sensation but also politics. 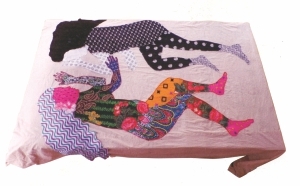 Tanjil Tusi, Self Conversation, video, fabric bed and pillow, 2013. Their art is perceptible for everyone. 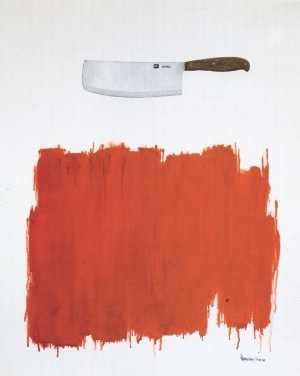 Even if you are not an educated expert in arts, you can feel the expression of the work and observe the discomfort the blood-soaked towel gives each visitor. “We want to reach the common people with our art,” says artist Tanjil Tushi. This means that not only well-educated and rich art buyers but also people like a rickshaw-puller, a rural worker or a child can enjoy the group's work. Their proximity to nature helps them to create sensitive art. “We were born in nature,” says Tanjil Tushi. The group is thus strongly influenced by the green surroundings of Chittagong, the power of the mountains and the sea. Since its foundation in 1998, Santaran has been promoting a stream of alternativediscourse on art. It looks to investigate and understand the interrelations between man, aesthetics and belief systems. The aim is not only to change people's perception, but to turn the world into a better one: “We believe that the inherent ability of art to intimately connect to and impact people's senses will ultimately lead us to ways to change society for the better,” argues Monjur Ahmed, president of Santaran. As a consequence, the art work of Santaran looks very critically at society and politics. A good example is the painting of Monjur Ahmed that shows a pink dog with two heads. Satabdi Shome, An Unexpected Story, acrylic on scroll, 2013. The animal is surrounded by dozens of other heads in the background. On every head, the word “politics” is inscribed. While looking at so many heads, the spectator gets confused which can happen while listening to politicians of different hues and colours. Furthermore, two hands are trying to straighten the dog's tail in the picture. But of course, as the famous proverb goes, it cannot be straightened. The artist uses the proverb in his painting to show that, like a dog's tail, no one can straighten politics. The exhibition is worth a visit not only for those who are interested in politics, though. Although the Santaran group members share similar origins, educational backgrounds and a common aim of dignifying one's life through art, their works are diverse in nature. “Santaran is a positive example of unity in diversity, and even though their geographical origin defines them in a sense, they are not confined by it,” says Katerina Don, Manager of Bengal Art Lounge. All the members of the group are actively involved with different sections of the Multi Disciplinary Art which has a vast range including Site Specific Art, Performance Art, Installation Art, Land Art and many others of the new Media Art. Bivol Saha, for example, investigates the nuances of man's relationship with the society. At the Bengal Art Lounge, he shows powerful paintings with heavily symbolic worms. Bivol Saha, Best of All Creation 1, acrylic on canvas, 2013. Md Nasir Uddin experiments with digital arts and new media. On the other hand, Noor-E-Elahi has created various metal installations. His work “Domestic Economy” shows purses and a shopping bag that hurt the owner when he touches them: The objects are covered with thorny nails. Shahidul Islam Khokon explores the concept of safe motherhood, to do which he uses modern ways of the new media. “A pregnant mother needs nice climate; she needs a perfect atmosphere free from tension,” the artist explains. Totally different is the technique of Satabdi Shome. She has drawn her own story – how she deals with the disability of her legs. She combines this emotional issue with beautiful drawings of nature. Not less fascinating is also the work of Tanjil Tushi. She is deeply involved in exploring the various aspects of a woman's life. For the exhibition, she has created two paintings of the Hindu goddess Kali. “Kali is the ultimate symbol of female power,” she says. 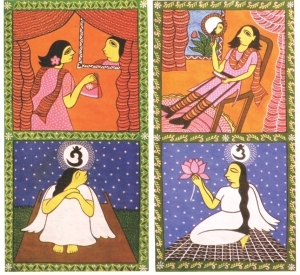 Tushi uses Kali to contrast it with the common image of women in society. “I want to change the society's view of women,” she explains. By putting on make-up or clothes, females often cover their real selves, the artist emphasises. In another work titled “Self Conversation”, she wants to show the sad and the happy mood of every woman. “At the end of the day, everyone talks to herself,” she says. To show the “Self Conversation”, the artist has stitched two bodies on fabric. The happy person is colourful, the sad person only black and white.